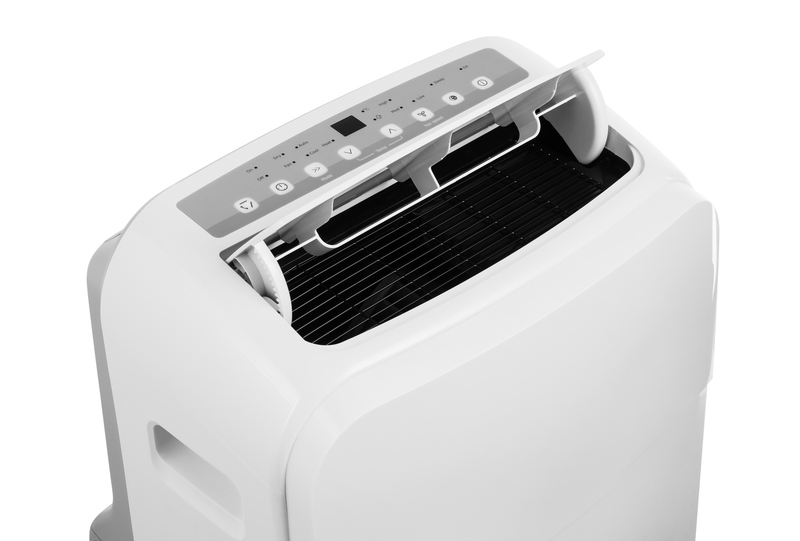 In this article, we present a complete overview of the best-selling portable air conditioners available on the market today. This comprehensive list is based on thousands of consumer reviews, as well as feedback from the WonderStreet community. Portable air conditioners are not as portable, as say a portable space heater, which only has to be plugged in to a source of electricity. However, they provide an easier way to cool a room when it is not practical to install a more permanent window unit or when there’s a need to change the location of the unit or to store it during the winter. Additionally, they act as a suitable back-up when more advanced air conditioning systems are not functioning properly and require supplemental solutions, or when it is not financially or physically practical for your situation. Most portable air conditioners have wheels so that they can be more easily transported from one location to the other, but they do require window installation. There are two different systems commonly utilized by portable air conditioners: the single-hose cooling system and the double-hose cooling system. The single-hose system pulls hot air from the room, cools the air and sends it back out into the room. Most of the heat is vented out of the window via the single outtake hose, which is held in place by a removable window frame. Though more expensive, a double-hose cooling system is more efficient. Units with this system have both an intake and an outtake house. Like the single-hose system, air is pulled into the unit, cooled and sent back into the room. However, as the machine warms up, the intake hose brings air from outside to cool the unit itself and keep it from overheating. The warm air from the room and from within the unit is expelled through the same outtake hose. In larger spaces or spaces filled with computers or other warm electronics, the two-hose system is ideal for optimal cooling and to ensure the longevity of the unit. Additionally, some units contain special features, such as heaters, dehumidifiers, auto draining systems, and auto-evaporation systems. While heaters usually underperform in comparison to standalone units, they work well to supplement heating solutions that aren’t completely effective on their own. Using a portable air conditioner / heater combination can improve conditions in those rooms where the primary heating solution isn't adequate. 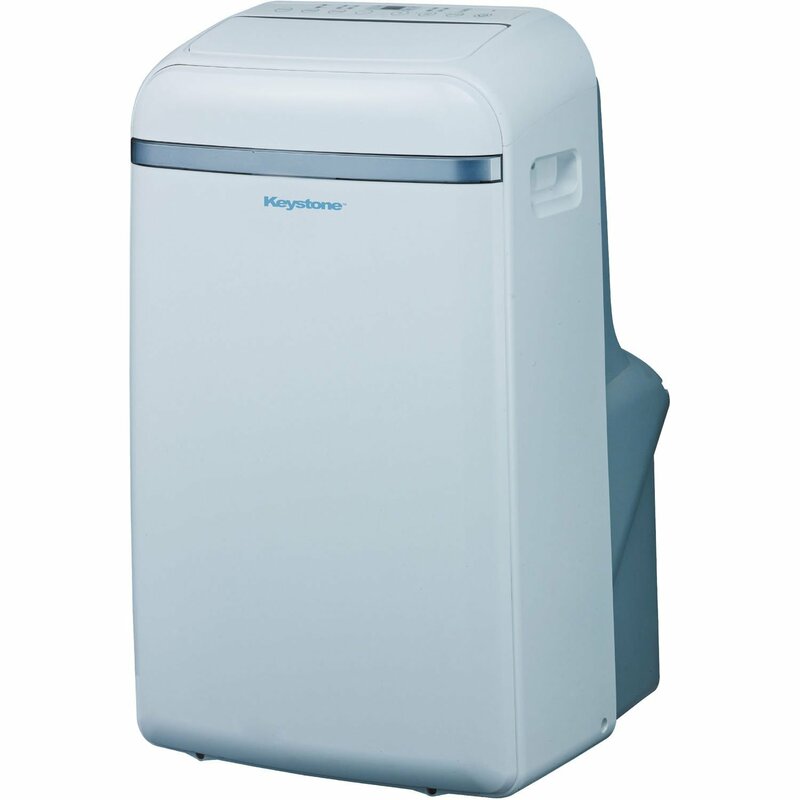 All portable air conditioners pull moisture from the room, therefore, they all function as dehumidifiers to some extent. 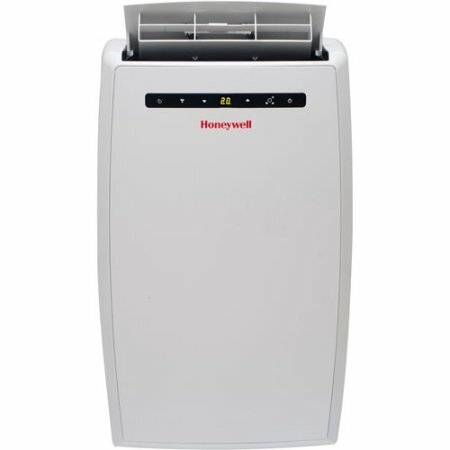 However, those units with an extra dehumidifier option can operate in this capacity without cooling or heating the air. When air is cooled, condensation is formed and this moisture must exit the unit. 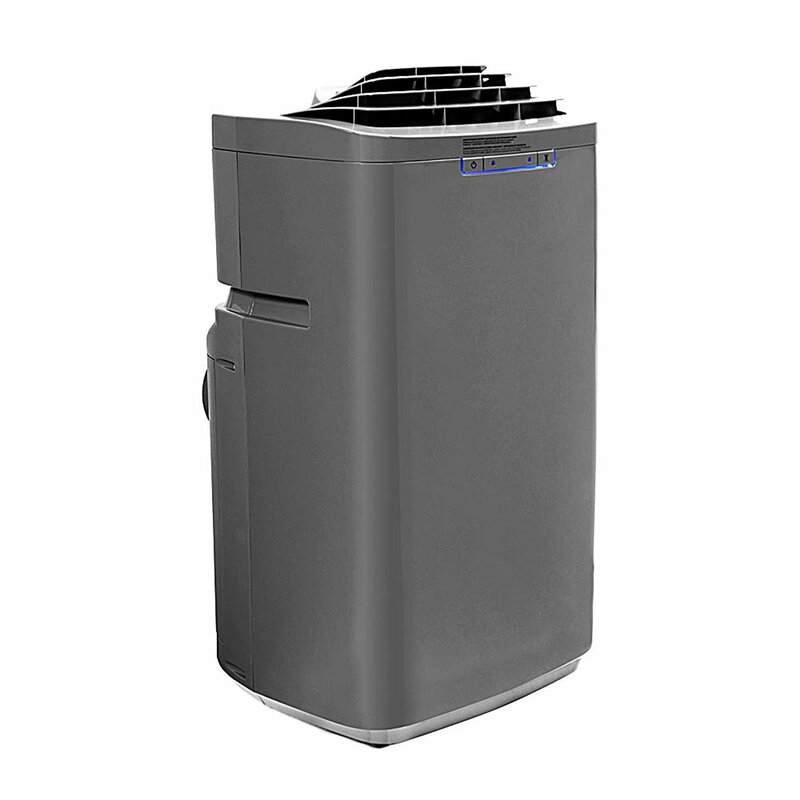 Some portable air conditioners have a bucket that needs to be manually emptied on a regular basis. Others have a more automatic approach. Auto-draining and auto-evaporation systems both solve the problem of potential water leakage and the need to frequently empty a drain pan. Auto-draining systems typically send excess moisture from the unit to a drain pan outside and require a window that is in an area where the drainage won’t pose any issues or where it can be collected in a large receptacle. In units with an auto-evaporation feature, the excess moisture is deposited on the internal components of the unit. The heat from the unit causes the moisture to evaporate and the unit to cool. This feature is somewhat less effective in areas with particularly high levels of humidity. To simplify this article, we have broken products down into two specific categories: single-hose and double-hose. The relevant special features are included and reviewed. The order in which these products are presented is not indicative of their overall quality or rating, and we do not have any connection to the manufacturers. Our descriptions are based solely on the pros and cons, quality and performance reported through numerous customer reviews from online retailers. At the end of this page, in the section titled “Final Thoughts,” we provide our own recommendations for each category. Do you have a portable air conditioner in your home or workplace? Tell us more about it in the comments section below! Key specifications: 12,000 BTU, 400 sq. ft. Among this unit’s features are a 24-hour programmable timer, three fan speeds, and an auto draining function that eliminates emptying the water tank. These features are easily accessible, as reviewers have claimed that the ARC-12s works well with the remote control that allows for adjustments away from the unit. According to most consumers, it is relatively quiet for a portable unit, but the most common drawback that customers regularly report is that the vents are not adjustable and remain aimed towards the floor, which doesn’t allow for ideal air circulation. The energy efficiency of this unit is a bit lacking in comparison to other options, and the window mounting kit and hose are often regarded as difficult to install. Additionally, like many Whynter units, the fixed angle on the vent points upward and cannot be adjusted. 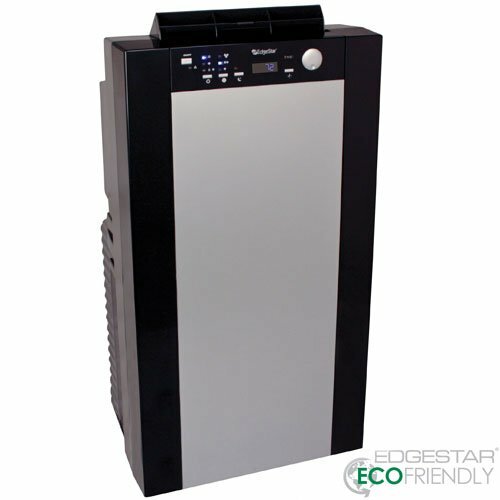 However, this unit also doubles as a dehumidifier and a heater, which means it can be used year-round. The heater function is ideal for spaces smaller than 500 sq. ft, and the dehumidifier can process up to 64 pints of moisture per day, which is beneficial in areas with high humidity. 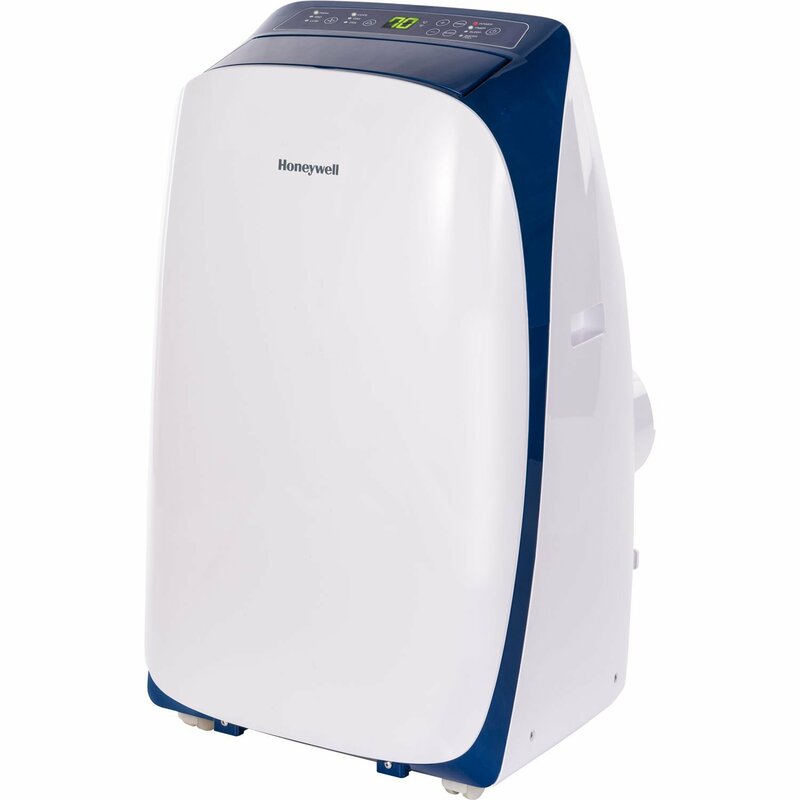 In addition to the dehumidifier function, it also has self-evaporating technology to repurpose moisture it collects during use as an air conditioner, thus reducing the frequency of needing to drain the water tank. Key specifications: 12,000 BTU, 450 sq. ft.
With this unit, there are no draining or evaporation features, so the consumer must empty the water tank regularly, which can cause leaks if not regularly drained. Consumers also mention that the large size of the unit makes for a heavy product, and it takes up more space than many units with similar cooling power. However, energy saving features help keep operation costs down. While the noise level isn’t as quiet as some units, the oscillating vents allow for good air-flow throughout the room. Another plus is the energy saving features that help keep operation costs down, though this not specifically a high-efficiency product. Key specifications: 14,000 BTU, 600 sq. ft. The major downside to this unit is that it is a bit on the loud side. 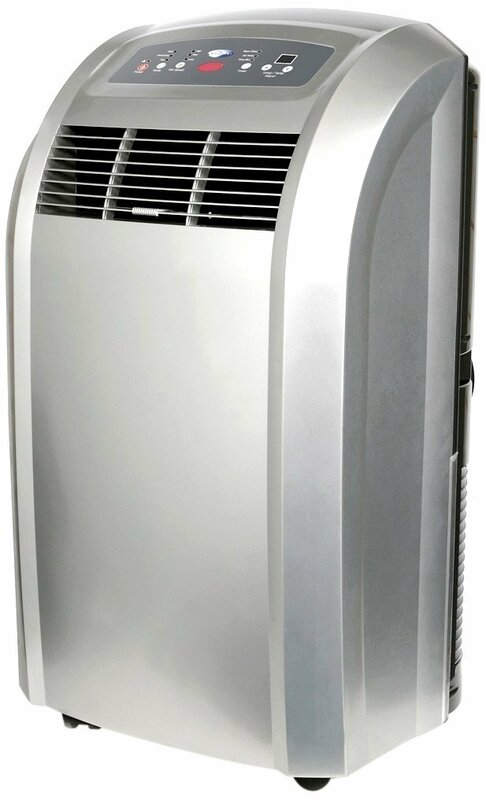 However, the overall size of the air conditioner is significantly smaller than other similarly powered units, making it a great choice when the need arises to move it frequently or real estate is limited within the home. While the vent is fixed in a position that points upward, it has oscillating louvers to help move air around, minimizing the airflow problem most fixed position vents have. The lack of a draining system or evaporation system means that the tank needs to be regularly emptied of water, but most reviewers were impressed with how well it works even in very high temperatures. Key specifications: 8,000 BTU, 200 sq. ft. Despite the small cooling power of this unit, it is actually fairly large in size and takes up more space than similarly rated units. 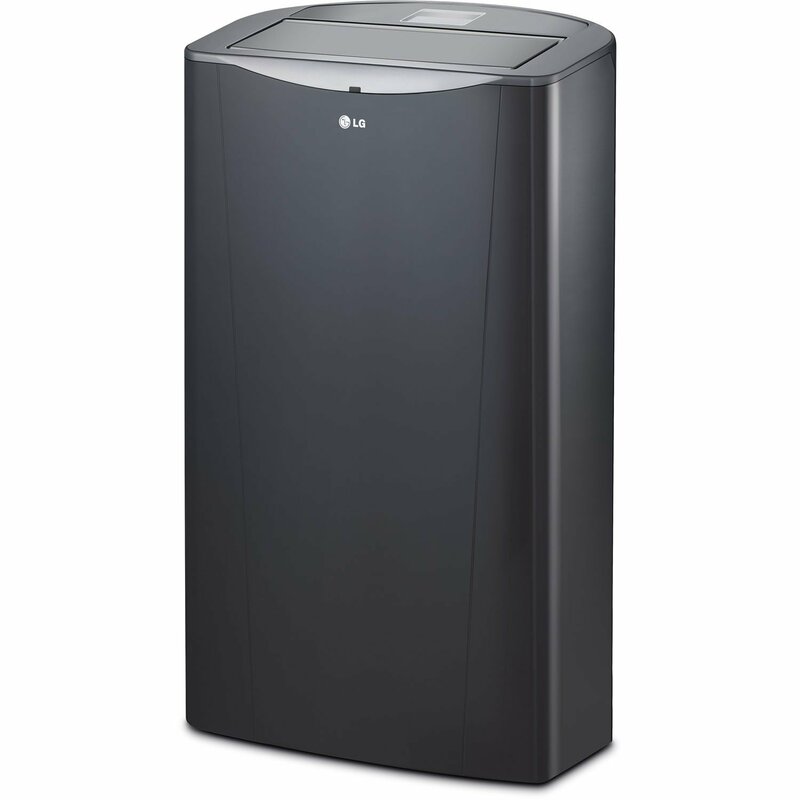 That said, in moderate weather, this LG unit works well in somewhat larger areas than its BTU rating suggests. In addition to cooling, this unit also offers a humidifier feature, a remote, and an easy-to-install hose and mount system. 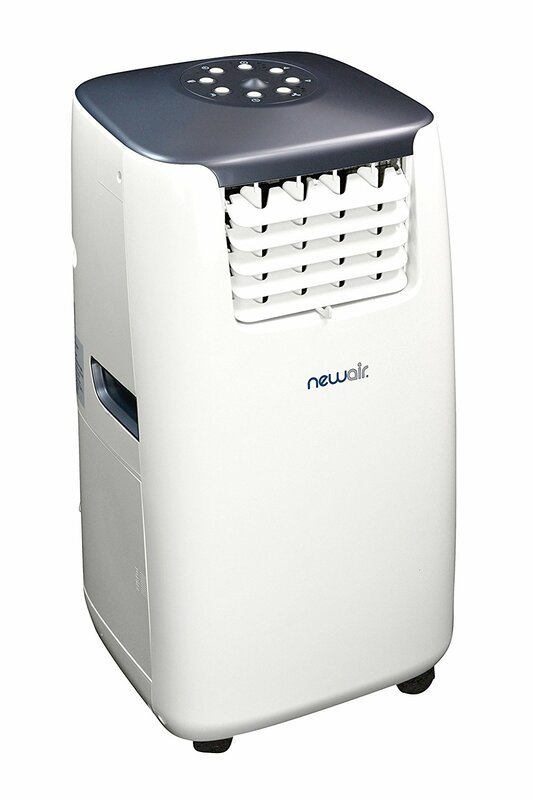 The dehumidifier can remove roughly 42 pints of moisture from the home per day, which is impressive for a low-powered two-in-one unit, but in regards to eliminating excess moisture, the air conditioner produces a lot of moisture during operation, which means it needs to be drained frequently according to reviewers. The biggest drawback is the noisy operation, which is painfully obvious in smaller areas where sound will bounce off the walls. Regardless of its few shortcomings, the praise it receives for cooling power, considering the low BTU, is impressive. Key specifications: 10,000 BTU, 400 sq. ft. 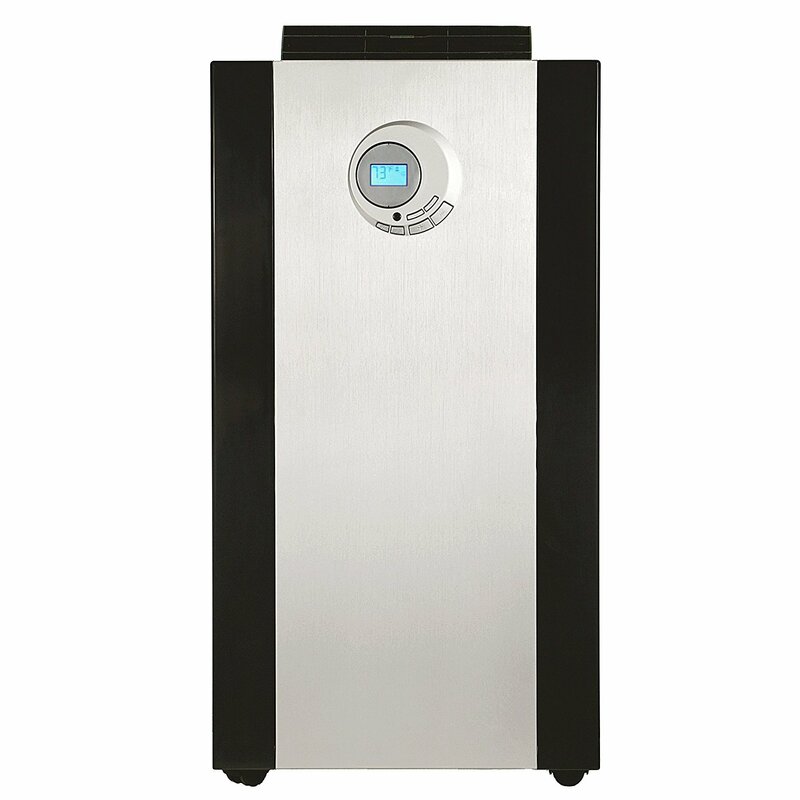 Considered one of the quieter models in this power range, it’s also highly energy efficient. Unfortunately, the temperature readout is often reported as inaccurate by reviewers, and the vents aren’t adjustable. Also, the outtake hose that connects to the window has poor insulation that may cause warm air to leak into the area being cooled, but this can be modified with duct tape or a large hose clamp. The self-evaporative system works well except in areas with high humidity, which may require use of the included drain hose. Ultimately, the overwhelming opinion appears to be positive, despite the few shortcomings, largely because this small unit cools very well once the insulation issue is fixed. Best of all, it is priced similarly to units that have much less impressive output. PROS: quiet, auto-evaporation system, dehumidifier. Despite adequate cooling power, reviewers note that there are some minor issues with the outtake hose and outtake vent. The vent is in a fixed position, which limits the airflow and increases the amount of time it takes to initially cool an area. The outtake hose, on the other hand, receives poor marks for construction that requires additional insulation and sturdy duct tape to secure it properly to the window for best cooling possible. In addition to cooling capabilities, this unit also serves as a dehumidifier that removes up to 86 pints of moisture per day, which also utilizes a drain hose to help reduce the need to drain the unit. Additionally, the auto-evaporation system removes moisture from the air conditioner by using excess moisture to cool the machine. Overall, this unit is a bit more expensive than others, but the cooling power and quiet operation make it a popular choice among reviewers. Key specifications: 14,000 BTU, 550 sq. 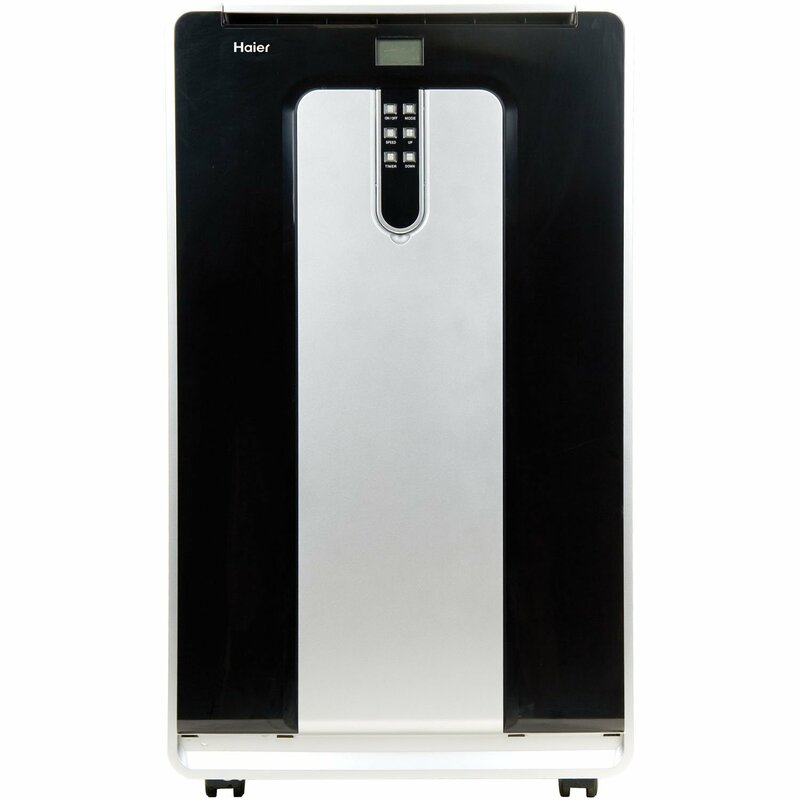 ft.
Reviewers typically agree that this unit works well in medium to large rooms, and they regularly praise it’s usefulness for a two-in-one system thanks to the powerful dehumidifier feature that removes 111 pints of moisture per day. The auto-evaporation feature removes the need to constantly empty a water tank by evaporating moisture to keep the unit from overheating, but the fixed vent pushes air upward, which many reviewers claim makes it take longer than it should to cool warmer rooms. In addition, the window mount for the outtake hose is often cited as needing some modifications to work as expected, and the remote control does not have a backlit display, making it difficult to use in dim lighting. On the positive side, the energy efficiency is adequate, and the relatively quiet operating noise is favorable, compared to many units with the same cooling power. Key specifications: 8,000 BTU, 300 sq. ft.
A bit expensive for an 8,000 BTU unit, the major downside with this product is that temperature cannot be adjusted without using the remote control, as there are no controls on the unit itself. However, the cooling capabilities of this unit are impressive, though a few reviewers note that it struggles with high outside temperatures. Also, the poorly constructed window mount causes problems that allows air to escape without some modification to make the hose fit snugly. Despite these shortcomings, this unit is a bit lighter in weight than most portable AC units, which makes it a great option for campers and other portable homes. Also notable is the dehumidifier function that can effectively remove 64 pints of moisture per day, which often receives praise for being surprisingly useful for a smaller conditioning unit. Some complain about noise, but others say that it’s only slightly louder than similarly sized units. The quiet operation noise and ample hose size make this unit easy for reviewers to appreciate, but the overly bright display makes it a less-than-perfect choice for a bedroom at night. The reverse problem is true of the remote control, which isn’t backlit and cannot be used in dim lighting. The thermostat system will turn off the compressor once a certain temperature is reached, but unfortunately, it leaves the fan on and doesn’t offer a setting to turn both off when the ideal temperature is met. Despite this small inconvenience, the hose and mounting system for the window are rated well among consumers for proper insulation, and the auto-evaporation system receives high marks as well. There are almost no complaints about needing to drain any water. 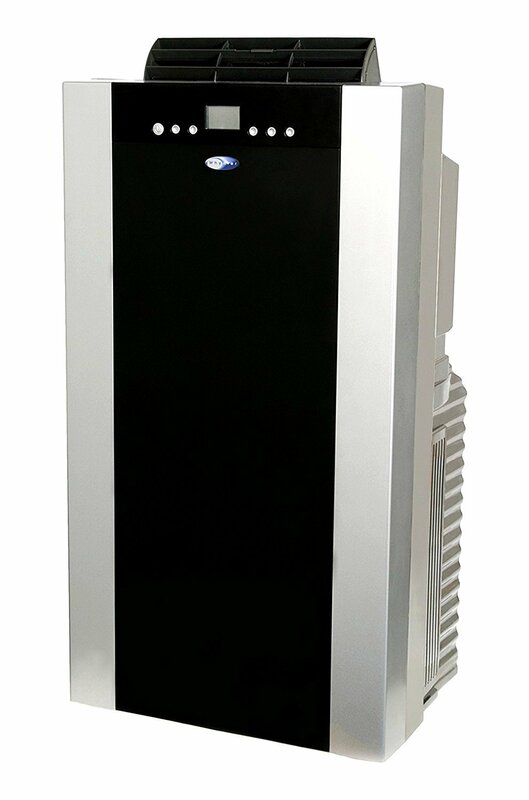 In addition to this unit, Haier also offers a 10,000 BTU version, and while it cools a smaller area, it is essentially the same in every other way. Key specifications: 14,000 BTU, 525-600 sq. ft. Unlike so many units with vents that point towards the ceiling, the AC141400E has front vents, which is a welcomed change for reviewers that are familiar with other models. As an added bonus, in dry areas, the top water reservoir can be filled with water to help improve cooling power. Several reviewers have seen decent results from this unit in larger areas when the outside temperature isn’t too high, and the small size and lack of auto-evaporation technology means that in moderately humid areas, the drain pan will fill up often and need to be taken out as frequently as several times a day. However, for dry areas, this is less of a concern. There is also the option of hooking up a drain hose to negate this issue. All things considered, for its small size, this is a powerful air conditioning solution. Key specifications: 14,000 BTU, 700 sq. ft. This Keystone unit has an impressive amount of cooling power, considering the size of the unit, and the dehumidifier very effectively removes 72 pints of moisture per day. Reviewers are pleased that this unit easily works in larger spaces, and the auto-evaporation system means that it doesn’t need to be drained often. While most reviews are positive, in some very humid areas, it may pose some small problems with water leakage if not drained often, as the auto-evaporative system cannot effectively evaporate the high levels of moisture coming into the intake, but only a few reviewers have reported this issue. Additionally, the outtake hose that sends hot air out the window is extremely bulky and rigid, which makes setup difficult, by requiring some additional insulation for the best results. Most notably, the largest problem that owners have reported is that it will sometimes cause a breaker to trip, which leads one to believe the energy efficiency is probably not ideal. 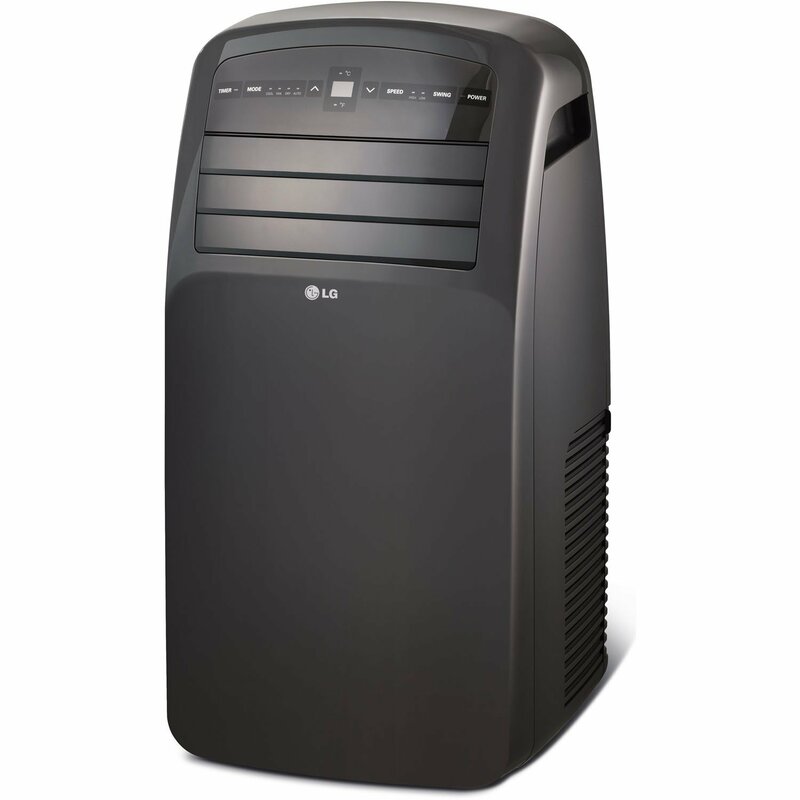 However, the cooling power is impressive, and reviewers are generally happy with this unit. While the overall construction is considered relatively inexpensive looking, there are no major issues reported concerning durability. 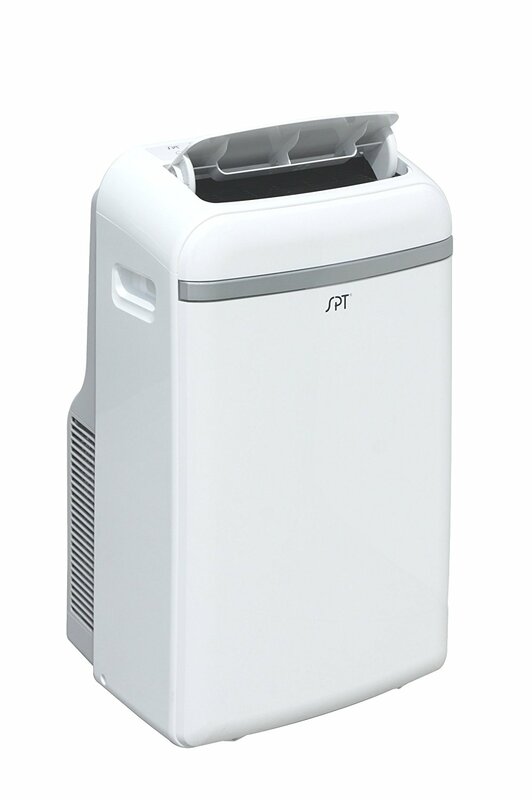 Unfortunately, many reviewers report that this SPT unit doesn’t perform well in rooms as large as the reported coverage area suggests, and the noise level is a bit louder than comparable units. Regardless, the dehumidifier works well to remove 70 pints of moisture per day, but consumers claim it isn’t as functional as a standalone dehumidifier unit. Additionally, in high-heat areas, some consumers complain that it simply doesn’t work at all. In less humid areas, the partial self-evaporation system means very little manual draining is required, but in high humidity areas, users say that draining becomes fairly regular since the auto-evaporative system cannot effectively remove high levels of moisture. Key specifications: 14,000 BTU, 500 sq. 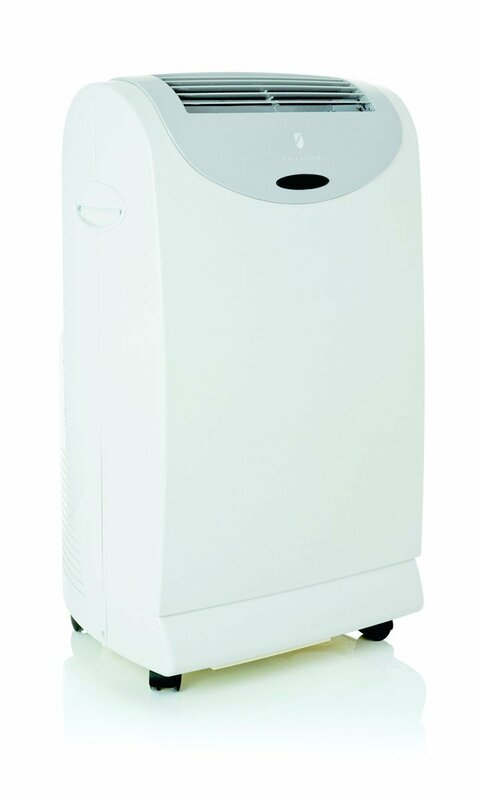 ft.
Aside from use as a portable air conditioner, this unit also has a dehumidifier and a heater, which makes it practical year round. The dehumidifier removes up to 101 pints of moisture per day, which is an impressive number for a two-in-one unit, and the heater can effectively warm similarly sized rooms up to 25 C (77 F). There’s also a model without the heater, but it’s not significantly cheaper. The heater and dehumidifier work best as supplemental aids to other solutions than the air conditioning power, but while these features are useful, the ARC-14SH shouldn’t be considered a complete solution. 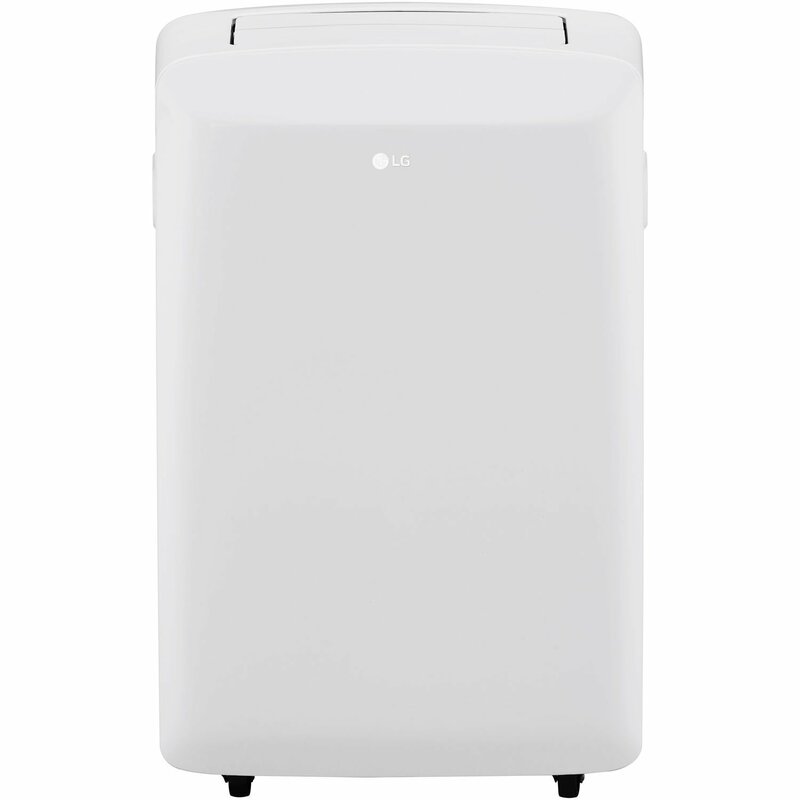 While most are happy with the results, a moderate amount of reviewers claimed this Whynter unit doesn’t work well within the suggested room size, and the overwhelming problem is that the fan itself is noisy. This means that regardless of which mode is being used, it is likely going to be loud. Adding to the list of concerns, this unit costs a bit more than other 14,000 BTU units. However, reviewers often assert that the added features and reliability are worth the additional costs. Key specifications: 13,000 BTU, 420 sq. 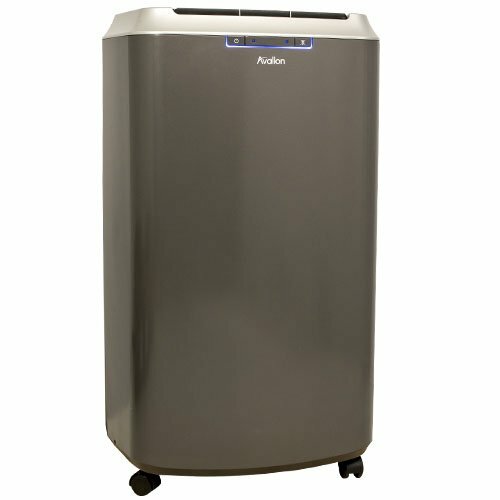 ft.
Reviewers are impressed by the cooling power and claim it works well even in rooms larger than the suggested maximum. On the negative side, the major drawback to the design of this unit is that the hoses sometimes aren’t a tight enough fit, which may cause some air leaks if not properly adjusted. Unfortunately, there are also no temperature controls on the unit itself, so it’s best to keep the remote with the unit. Reviewers mention that the remote’s display can sometimes be inaccurate, as well, if not properly lined up with the unit during operation. On the positive side, most reviewers claim that this is among the most quiet portable solutions they’ve used, and it also offers a dehumidifying system that removes an impressive 91 pints of moisture per day. Additionally, moisture is managed well thanks to the self-evaporating method that reduces the need to drain water and keep the unit running efficiently, and it’s reported that this works extremely well for this particular unit. However, it doesn’t offer the auto drain feature other Whynter models use. Given the higher price point of this unit and the complicated controls, it is not as impressive as some of Whynter’s other offerings. However, it is built with high-quality materials and will last several years of regular use. Because it’s well-built, it’s heavier than other units with the same relative power, but caster wheels make it easy to move. Most consumers agree that it works very well in appropriately sized areas, however some have argued that it doesn’t operate well in humid or hot areas. That said, other features work extremely well, such as the dehumidifying feature which removes up to 91 pints of moisture per day, making it fairly reliable for a two-in-one unit. Most reviewers asserted that the ARC-143MX runs quietly, and while the controls are a bit complicated, they are extremely extensive once learned. So while this unit is a bit more expensive than similarly powered units, its' features help justify the added cost. Key specifications: 13,500 BTU, 700 sq. ft. 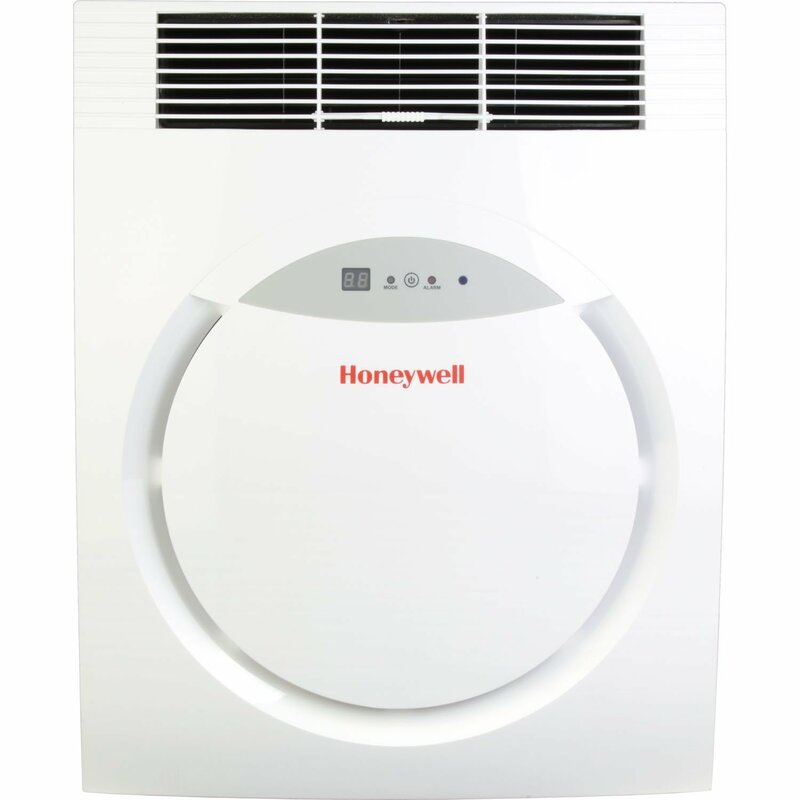 This unit offers cooling, heating, a dehumidifier, air circulation features, and the cooling power comes on quick and strong. To expand on these features, the heater operates with 10,700 BTU, making it useful for small areas as supplemental heat, and the dehumidifier option removes up to an impressive 144 pints per day. In addition, a drain-hose is dedicated to the dehumidifier itself to allow simple draining, so if ability to keep the air dry is important, this unit is amongst the best choices. Also, the self-evaporation technology works well, though in heavy humidity, it may require occasional draining as well. Several consumers confirm that this air conditioner typically works better for slightly smaller areas than the suggested 700 sq. ft. or less, and it is well noted that the loud operating noise and poor user interface make it less than ideal. However, the relatively quick cooling ability may make up for these less-than-ideal cons. Despite the fact that the PH14B is a bit more expensive than units with similar power, those that also want a reliable dehumidifier can justify the added costs. Key specifications: 14,000 BTU, 525 sq. ft. The built-in heater works as well as the air conditioning, which is a bit rare in these small portable units. This unit is also rated high for energy efficiency, making the cost of operation relatively low. This is impressive considering the noise level is minimal compared to many similarly sized units. The most common complaint is that the drain pan is located in a spot that is difficult to reach, and as such, it is prone to spills during removal. Likewise, the direction of the vent is fixed upwards, but the decent cooling power quickly makes up for the less-than-ideal airflow. Moving to other features, the dehumidifier poses no issues removing up to 85 pints of moisture per day, but it is not especially powerful considering the cooling power of the unit. The manufacturer claims that the heater should only be used to supplement other heating solutions, making this feature less than useful as a standalone solution. However, a handful of reviewers use this unit for air conditioning in larger spaces than suggested by the manufacturer with decent results. 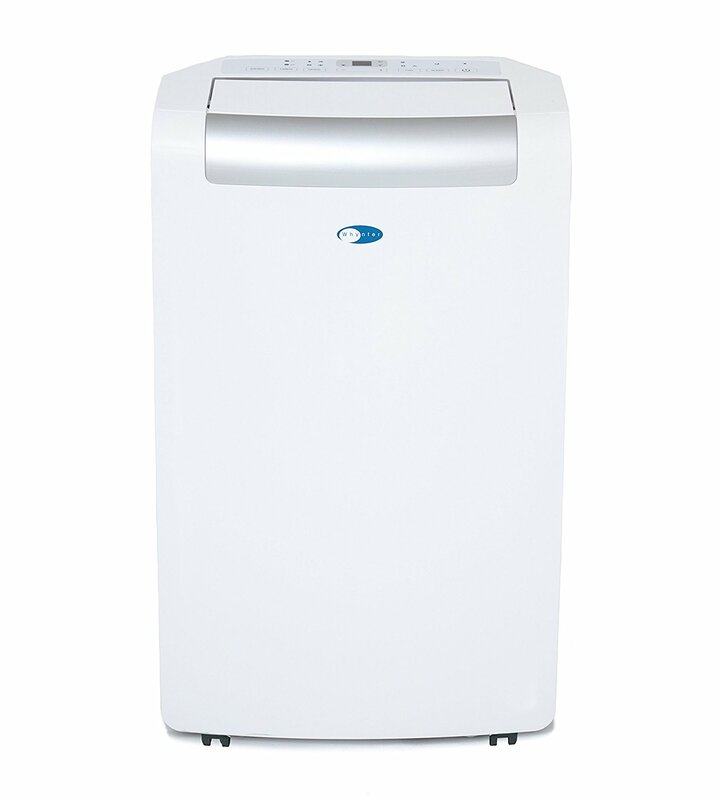 The Avallon offers impressive cooling and dehumidification, and it comes in two models, one with a heater (APAC140C) and one without. The price difference between the two options is often minimal, so the added benefit of heating is a bonus for users in moderate climates, but the heating unit isn’t ideal as a standalone solution. Both models include a dehumidifier option that removes up to 86 pints of moisture per day, and their self-evaporation technology works extremely well. However, the remote control does not always work well, while at the same time it can sometimes be a bit fickle and reset all settings if accidentally dropped. Still, the cooling power is so impressive that remote control issues are only a small inconvenience in comparison. It may be obvious now that portable air conditioners can’t quite compete with window units or central heating and air, but it is fair to say that the sheer amount of respectable options means that they’ve come a long way in bridging the gap. After analyzing thousands of consumer reviews, it is our belief that there are obvious choices in each category when choosing a single hose or double hose portable air conditioning unit. In the single hose category, reviewers favor the Honeywell MN10CESWW. Despite a few shortcomings common with portable air conditioning units, this 10,000 BTU unit cools extremely well, even when used in spaces that are larger than intended. It is also extremely energy efficient and boasts being one of the quietest units available on the market. In the double hose category, reviewers favor the Whynter ARC-131GD for impressive cooling power and superbly quiet operation. It requires the use of the remote control for adjusting temperature, but this small inconvenience isn’t enough to deter reviewers. If heater and dehumidifier options are preferred, customers gravitate towards the Whynter ARC-14SH for cooling power and quietness similar to the ARC-131GD with these added features. Do You Like Your Portable Air Conditioner? If you have a portable air conditioner, let us know in the comments below how well it works, how loud it is, and if you’d recommend it. If you’re looking for one, let us know which models you’re considering. We’d love to hear from you!